Easy to use diagonal ski-carry system with tail loop (up to ~115mm wide*) and shoulder hook. No pack removal necessary. Insulated water bottle holder (+28g) on the shoulder strap that is removable if you prefer to use a bladder which is also compatible. Velcro safety box on the side for easy storage of crampons and accessories. Comes with removable divider (+87g)*. Unique probe slot accessible from the top of the pack and enough room inside for your shovel. Main compartment has zip access from the side, with a separate zipped mesh pouch inside. Highly breathable shoulder straps and anatomical airmesh back so you don't sweat yourself cold. Speed ice axe holder is a simple slot on the front that keeps the sharps pointed down. * Update 2015/16: Dynafit added new colors (Asphalt, Red) and reworked the crampon pouch to have a built-in collapsible divider instead of the removable pad. Also the ice axe carry changed to a wire loop and the ski carry can fit wider tails up to 130cm. Weight is within a gram of the previous edition. Notes Great water options, mesh straps allow good airflow. I bought this pack to replace a heavier BD day touring backpack I had and so far, I've loved it. The crampon pouch is great for a small puffy, snacks, and a ski strap while the inner area just fits a shovel, probe, and skins (if they are skinny skins for skinny skis). 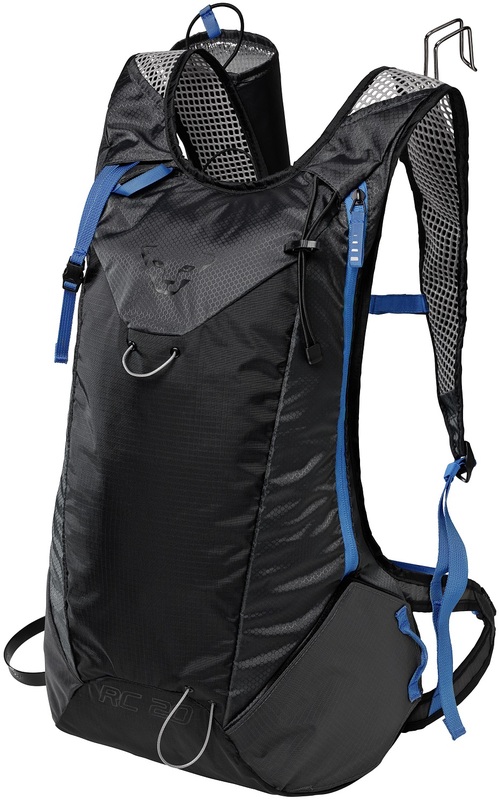 I don't think this pack is durable or big enough for peak bagging missions but it is perfect for light and fast tours or recreational racing. For what it is designed for, i.e. racing, this pack works great-- it is easy to use the ski holder and bottler holder. For everyday use, the stiff safety pocket, as well as the lack of adjustment and padding and helmet holder, make this not an everyday pack for me. The durability of the wire loops is also questionable; recommend only using for their purpose as odd directions of pull will cause issues -- luckily Dynafit warranty has been quite good. If you're looking for a colorful and reasonably priced race pack, this is a good option, but just not for everyday skins. What shovels blades fits in the internal pocket of the RC20? Hi Marcus, the race blades (CAMP Crest, ARVA Ultra, Merelli Carbon) fit in the internal mesh pouch. Bigger shovels can be thrown in the main compartment but won't fit in the zippered mesh. I have used this pack two times now and I have to say the fit and comfort is great. I really like the crampon compartment and used it to stash wet gloves during one of my skis, nice to keep the main compartment items dry. I feel that the weight/durability ratio on this pack is very high. Yes, you can go lighter, but I think you decrease the lifespan from lots of use. I am taking off two stars because after using the ski retention strap two times, the attachment piece is 90% detached from the elastic and close to falling off. I would have expected much better quality from Dynafit on this kind of piece and don't feel that two short uses would create almost a full failure on a key item to have when needing to carry your skis. Agreed Tom, sorry for the trouble. Send us a pic and we'll start a warranty case. 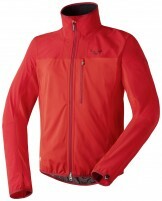 Overall: Five Stars for an excellent skimo race pack that can also be used for “real” touring. Background on product familiarity: I bought the very first version of the RC 20 and used it for a season of training, racing, and real tours too. I eventually sold it when both the Dynafit Broad Peak 28-liter pack became my top choice for springtime tours and the lighter CAMP Rapid 260 became available for lighter-duty applications. First, the first impressions out of the box: If you haven’t yet used other skimo race packs then the RC 20 will seem impossibly light. Otherwise, it’s kind of middling. The capacity claim though is accurate, the side-accessed lower compartment is super convenient, and a strap-mounted bottle carrier is included (as well as removable if you don’t like it). Plus of course a quick-attach ski carry system. Second impressions, in use: Everything works very well as designed. For the bottled holder and quick-attach ski carry system, see my Broad Peak pack review for details. Pretty much the only caveat is that the shoulder straps can get confusingly twisted up sometimes when putting the pack back on, but you hardly ever need to take the pack on and off. Third impressions, for long-term durability: I sold mine before it underwent too much abuse, but it was still almost indistinguishable from new after some very long tours, although I’m not sure if the material might have changed since then? But although the velcro on the side-accessed lower compartment might seem suspect, the same design is still going strong on both my Broad Peak and Manaslu much-abused packs. I have been using the Dynafit RC20 pack alongside my CAMP Rapid race pack and am starting to really like it. While it is not light enough to compete with the "true" race packs like the Rapid, it is much more durable and serves well as a day to day training pack. The safety box has never come open on its own and seems pretty solid so is not a real concern for me. Material and buckles seem pretty solid. The side zip is easy to use. Axe attachement works great and it is even possible to attach 2 ice-tools semi-securely! I wish there was a right side shoulder strap pouch (like the Rapid) for storing small items: gels, sunglasses, camera. The bottle holder is bulky! It could certainly be smaller. The crampon pouch is quite large - I certainly don't have any crampons that are that big. The lower ski attachment point is not adjustable! Unless you are using skinny race skis, they will not fit in the ski carry! I picked this pack up at the first of the season. I don't race, but I do appreciate light gear. It is the perfect size for easy (no ropes) day tours. I don't really get the safety box and kind of wish it was just sewn up, I'm always worried about it opening accidentally although it hasn't happened yet. I like the side opening (all I've ever known is top loaders). My small CAMP shovel fits well and I like the sleeve for my probe, but there is no good place for the shovel handle. There is enough room for an emergency kit, gloves, puffy and food, but not much more (which helps me save even more weight because I leave more stuff home). The fit is great and I really dig the ski attachment system. I'm looking to by a bigger pack with the same system for longer/more technical tours. The exterior bottle holder is a little big for the bike bottles I use (maybe they make a specific bottle for it? ), so I switched it for a CAMP model that I had around. Overall great pack and I would buy it again.